I should have gotten the camera out earlier in the process, but here's everything lined up and ready for the fixture. It's a small frame, 48cm c-c, and we decided to go with standard gauge tubing and nice simple Henry James lugs and fork crown. 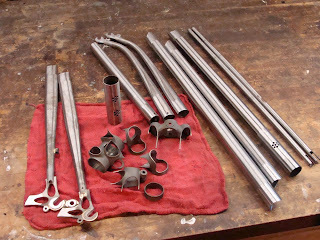 I prepped the head lugs so they fit tightly together on the short head tube. 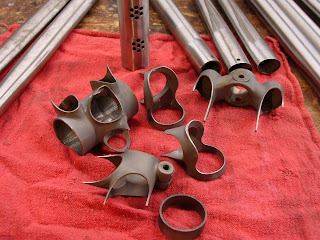 The rear dropouts are already ground down for the tight angle of the small rear end. Here's some closer up shots of the lugs! Should have some more soon, I managed to get the frame and fork tacked and brazed last night, so stay tuned!